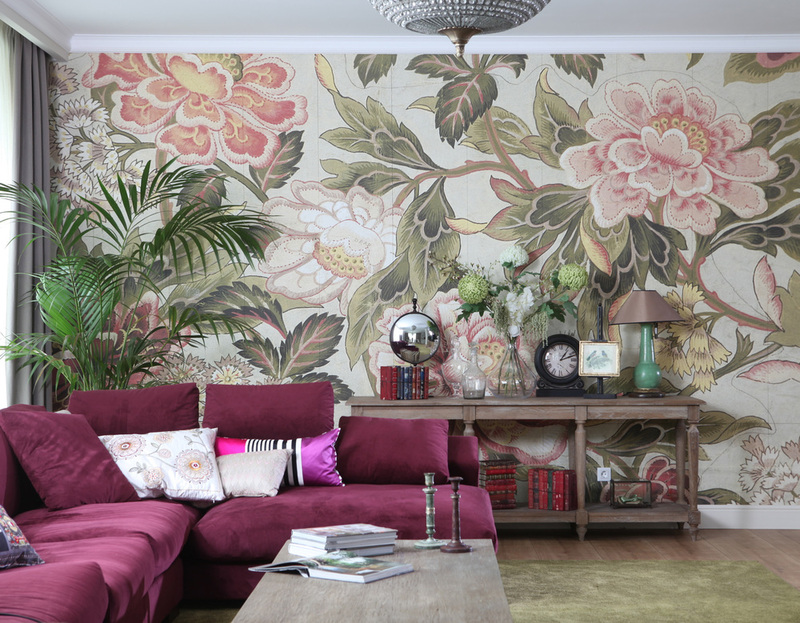 When we think of floral prints, old fashioned romantic wallpaper will come to our mind. Floral designs are making a major comeback. Brining nature into the home will be a strong trend in 2016. While small prints definitely feel feminine, bold florals, especially large patterns are very modern. There is nothing so beautiful, attractive and colourful as flowers. It expresses one's love of beauty. Oversized and bold floral print feel fresh and adventurous. Modern florals add a splash of warmth and cheer, they will create a cool look. Studies demonstrated that for those who are no morning persons, looking at flowers first thing in the morning, gave them a boost of energy that lasted through their day. So think about it when decorating the breakfast area: make it colourful, bring nature inside by using a floral wallpaper. Upholster those classical chairs with a colourful floral printed cotton. A fresh colour palette will brighten up even a grey and rainy day. Using floral prints can be intimidating at first, but once you start playing with them you will see it is not that difficult. Guaranteed that you add life and joy to the space. Mixing florals creates energy. 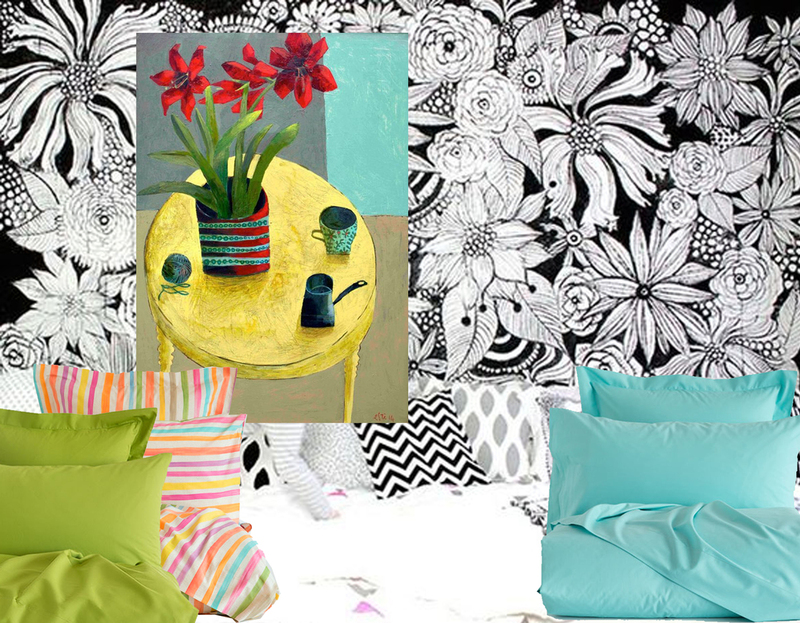 You can start with a black and white floral print, add a colourful and expressive painting, some stripes and simple pillows in colours taken from the painting: your room will be filled with joy. The key to pairing prints is by using matching colours. Choose one big pattern, f.ex. the rug and add a lot of different printed cushions. With a common colour palette you can't go wrong. A classical rose, with old-fashioned cross-stitches will give a homy feeling to the big scale design of the rug, and a modern touch to the typical English sofa, upholstered in velvet. You don't need anything more than a simple bouquet of fresh cut flowers to bring life to a room in neutral colours. The home can be made cheerful, lively and beautiful by a proper arrangement of flowers. The bathroom is the first room you probably will enter in the morning, or the place you want to relax after a full day in the office. Did you ever think of adding flowers in the bathroom? It will give a feminine touch. A floral printed shower curtain can add some old-fashioned drama. In winter it will remind you of the warm days of summer and it will create a special and unique atmosphere in the room. Now that spring has arrived, all those colourful and beautiful flowers are the perfect inspiration for doodling, painting or sketching. I found even a Flower Power on-line class.... perfect for a relaxing weekend, enjoying the garden. Nature provides us a simple way to improve our emotional health, it relieves the stress of our hectic lifestyle. The presence of flowers triggers happy emotions, heightens feelings of satisfaction. So a good reason to add flowers in your home. A floral arrangement can create a mood without using words, just colour. Seeing flowers in the morning will bring you in a positive mood for the rest of the day. so this week: buy yourself some flowers!